The best way to make meaningful connections and relationships is to focus all your energy on yourself. Right? Wong. Very wrong. The same applies to companies and their branding. The fact of the matter is that in order to build a successful business you should put the focus on your target audience instead of yourself. It will take you significantly further. Just as we don’t like meeting people in real life who only seem to talk about themselves, we don’t care for companies who do the same thing either. Of course, there is nothing wrong with promoting yourself – you’ve got to in order to be noticed and known. But it’s all about how you do it and what exactly you’re trying to promote. The truth is that when a company is bragging about themselves, they simply aren’t talking about anything valuable to their target audience. That’s all it boils down to. Here’s a perfect example to illustrate this point. Let’s say you run a large fabric retail website. You have a large selection of fabrics and a spacious warehouse to house it all. Then, let’s say you’re tweeting and posting pictures of the warehouse and boasting about how large of a selection you’ve got to offer. As a consumer, do you think anybody would care? Probably not because the size of your warehouse is irrelevant to your target audience. Instead, I’d urge such company to reconsider their approach. First, you must understand who your target audience is made up of. Amateur fashion designers care about different things when buying fabric then furniture manufactures. Second, by putting the focus on your target audience’s wants and needs you’d end up creating content that they actually care about. Wouldn’t you agree? Branding is a delicate thing. I say this because as a company you have a choice. And what you talk about, and how you talk about it makes your brand. You have an option to brag about yourself or to put the focus on your target audience. Any time it’s possible, shine the light on them! Always ask yourself if what you’re putting out would be of value to your target audience. Take for instance Headspace. 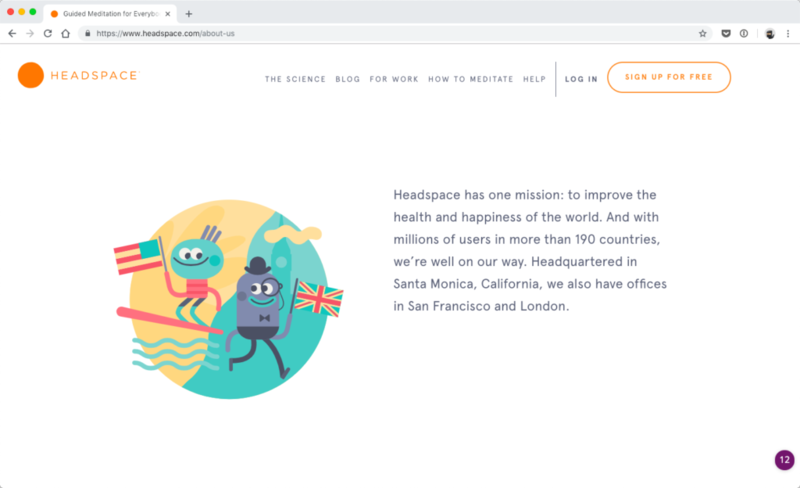 A company on a mission “to improve the health and happiness of the world.” On the Headspace’s about page, you can find a straightforward, but honest, account of how the company started and why. However, the way their story is positioned focuses on the core of their mission which to help others. Sure, it talks about Headspace, but the tone is humbling and personable. As you can see, even the about page is an opportunity to put the focus on your target audience! Headspace most definitely practices what they preach. In their mobile app, they have a very successful and loved Basic Meditation version that is free for anyone to use. 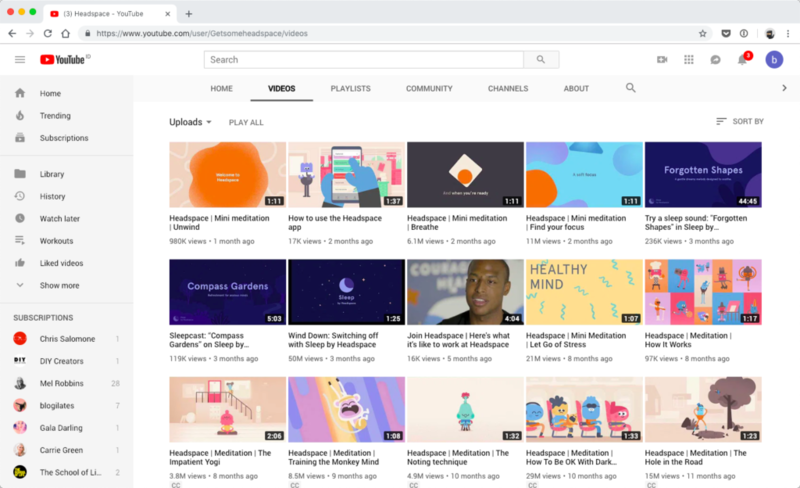 Their free meditation series is of high quality for anyone who is not ready or willing to convert to a paying customer. And that’s okay. By making sure their free app content is top notch, they are still putting the focus on their target audience. Converting people in paying customers is essential. But, at the very least, Headspace is gaining a loyal fan. Headspace’s social media also puts focus on their target audience. On their YouTube channel, they have a bunch of short and to the point meditations such as meditations on changing perspective or impatience. Even Headspace’s LinkedIn account is filled with articles and content that focus on helping busy professionals stay healthier and happier. As you can see, Headspace is still promoting their own content. 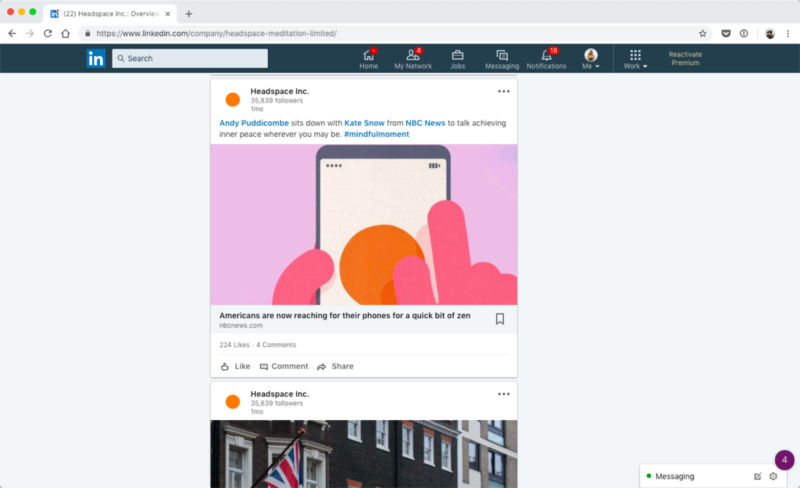 But their content is targeted to each social media and the users there. That’s what makes their content valuable to their followers and the target audience on the individual platforms. Any designer or even business manager will tell you that you can’t have a successful company without a mission and vision. Us brand designers use this information to form the foundation of your brand story. When you realize that the most successful brand stories, aka the brands that thrive, focus on an outside factor. Meaning they want to help others somehow. And if your company also wants to positively influence others, it only makes sense that as a brand you can’t fulfill this story or mission by putting the spotlight solely on yourself. It will help your mission to keep putting out value and putting the focus on your target audience as much as possible. The company flaunts how natural and amazing their product is. Their hair mask is free of Sulfate, phthalate, paragon, and gluten. It’s safe to use on colored hair too. The product is also 100% vegan and cruelty-free. And it’s even PETA approved as well. Coco & Eve is not shy about their efforts for a healthy and conscious product. Nor are they shy to show off the amazing results their healthy and sustainable product gives. Additionally, they often post reviews by well-known influencers as well as everyday people. The reason I’m mentioning all of this is that Coco & Eve’s audience cares about these things. They care that the product is free of harmful chemicals and not tested on animals. They also care to see what other people think about it and how it has helped them with their hair too. All in all, this kind of content is valuable to Coco & Eve’s target audience. All of this makes for a successful brand story. They figured out how to turn their vision of a healthy hair mask – for both the hair and the environment – and they are using it to fuel their success. They focus on the story they are trying to tell instead of themselves. The big difference here is that by showing off the quality of their product, they are continuing to tell a story that’s captivating and important to their target audience. As a company, you must remember that you get to steer this conversation. You get to decide if what you say (and how you say it) is a brag about yourself or a love story to your target audience. With every piece of content, you produce you get to decide if you’re adding value for your ideal clients by putting the focus on your target audience. Now, love stories don’t have to be totally sweet! You don’t have to continually shower your website visitors and social media followers with endless compliments and praise. You still have a sale to make! The best way to still stay true to your brand story and keep the spotlight on your potential client is to get real and get honest. Don’t beat around the bush. Your website and your branding both allow you to take charge of the conversation. So make sure it’s direction-free and to the point. When you’re direct, you grab the attention of your ideal clients faster. And deter those leads who wouldn’t otherwise qualify. This approach has the potential to improves your conversion rates dramatically. It can even influence your retention rates as well! This is important because when you touch upon the right vulnerability, it forces the lead to picture exactly what they need in order to address their pinpoint. (Afterall, you still would be putting the focus on your target audience!) When posing these uncomfortable pain points, this gives you an opportunity to swiftly come in and set yourself up as an authority. Once you do that, you’ve given yourself a platform to provide your offer, aka their solution, on a silver platter for them. In their more vulnerable state, they are much more likely to connect with you and therefore convert. However, you can’t achieve this emotional bond without first putting the focus on your target audience. Think about all the times you’ve ever been networking. The best way to make the most meaningful connections is to focus on the other person. The same is true in business. This article forces you to think over how you approach your target audience as a business. It’s vital that your business provides value to your ideal clients and put the focus on your target audience instead of bragging about yourself. How do you feel about putting clarity over visual design of your next website? How do tech companies benefit from superior business results? When a visitor reacher your website, they unwittingly seek answers to two questions: am I in the right place and do I trust this company? When things get in the way of a visitor saying yes to both of those questions they leave. Small design elements can have a huge business impact when they get in the way of those two questions.